Stephen Morris is the North West Chairman and Communications Director for the English Democrats (Party), as well as the General Secretary for the Workers of England. Stephen first got involved in politics when he was elected Unite (Union) Branch Secretary at Metrolink in February of 2003. While serving Unite, and watching the Labour Party operate from within the union, Mr Morris recognised that the interests of the indigenous English people were systematically being ignored by one of the largest Unions in the UK, as well as the treacherous Labour Party. Since then he has been a proud thorn in their side. Stephen is a now an active member and representative of the English Democrats, an England based civic nationalist party that seeks English independence, founded by long-time politician, Robin Tilbrook. 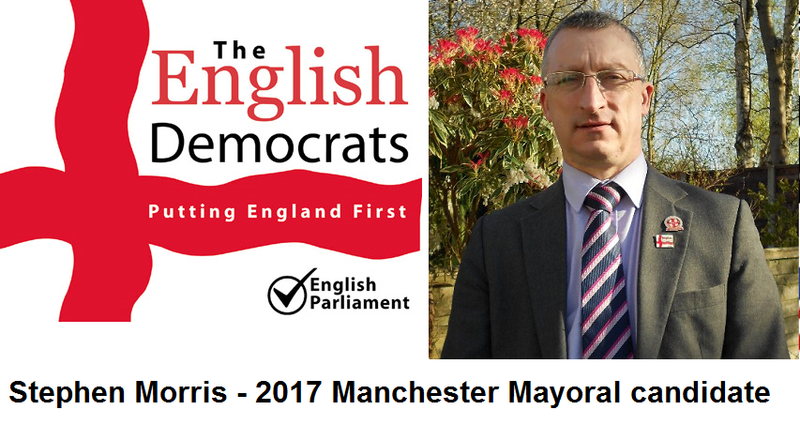 He represented the party as their candidate for Mayor of Greater Manchester in 2017, as well as serves them as their North West Chairman. The English Democrat's manifesto can be found here. Mr Morris's blogs from his own website, and has appeared on RT and various other news programs. Edward O'Sullivan sat down with Mr Morris to discuss British politics, the Islamification of Britain and other important topics. Edward also sits down with the leader of the of the People's Social Freedom Party - PSFP, Dion Gibbs, for a fascinating discussion. Although Mr Gibbs is based in Spain, he originally hails from Croydon-a part of the London Metropolitan area that's seen cataclysmic changes during his lifetime. This is a fascinating conversation with an energetic young man who cares deeply about his people.